Martin Nguyen is back in a big way. 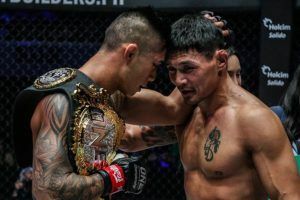 After failing in his attempt to win a third ONE Championship title last year and a knee injury that ultimately forced him to surrender his lightweight belt, Nguyen was determined to make a lasting impression with his return on Friday in Manila. Consider it mission accomplished after Nguyen landed a spectacular flying knee to finish Narantungalag Jadambaa in the main event at ONE: ‘Roots of Honor’. 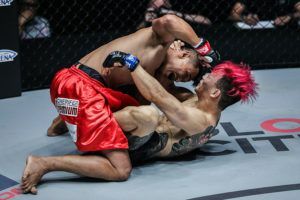 The finish came thanks to a series of stinging kicks that saw Nguyen just chip away at Jadambaa’s lead leg during nearly every exchange they had on the feet. The constant barrage of kicks started to really take its toll because as the second round got started, Jadambaa was already limping and favoring his lead leg, which was like a giant target to Nguyen at this point. The former two-division champion smelled blood in the water and he just started firing off kick after kick, which led to Jadambaa backing up towards the fence wincing in pain. The momently lack of focus as Jadambaa was paying attention to his injured leg allowed Nguyen to run forward with a flying knee that absolutely demolished the former champion. 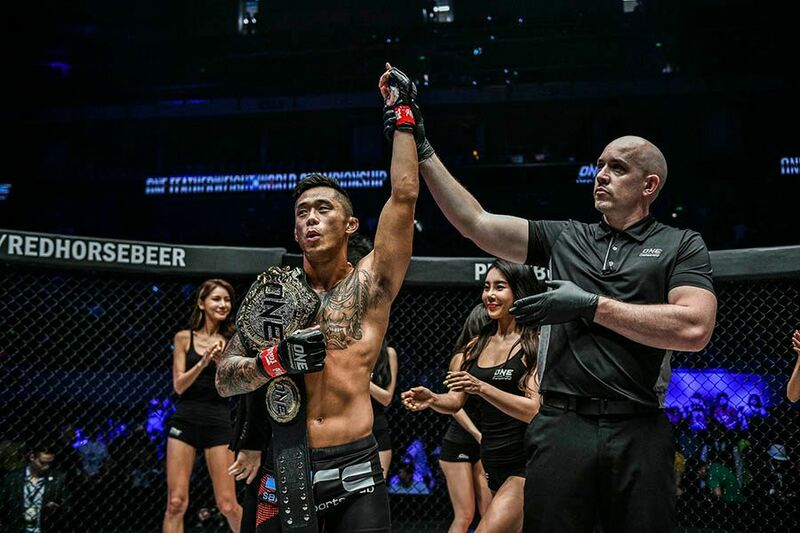 Jadambaa crumbled to the mat as Nguyen quickly raised his hands in victory in a much needed celebration after a tumultuous nine months out of the cage. With the win, Nguyen (12-3) not only defended his ONE featherweight title but he sent a strong message to the division that the champ has returned. As for Jadambaa (14-6), the 43-year old Mongolian may have seen his last opportunity to win ONE gold slip away from his hands after falling to Nguyen by second round knockout on Friday. What started as a somewhat lackluster rematch ended in dramatic fashion after Joshua Pacio put Yosuke Saruta down and out with a jaw-dropping head kick in the fourth round in the co-main event. After their first fight ended in a split decision, both Pacio and Saruta were a little gun shy in the rematch. Pacio managed to connect with a well-timed spinning back kick to the body in the opening round, which was later countered thanks to a huge right hand straight down middle from Saruta that put the Filipino fighter down on the ground. The flash knockdown definitely surprised Pacio but he quickly recovered to get back to his feet and reset. The action slowed dramatically in rounds two and three with a lot of posturing from both fighters as neither one of them wanted to make a mistake that could lead to a finish. That all changed in the fourth round when Pacio finally connected on a head kick after he was constantly attacking with that strike throughout the fight. Just as Pacio launched the kick, Saruta made the ill-fated decision to dive forward and he was blasted with a knee that sent him crashing face first down to the canvas. The Manila crowd erupted as Pacio celebrated the victory as he wins back the ONE Strawweight World Title after falling to Saruta back in January. Following this latest result it’s tough to imagine that Pacio (17-3) and Saruta (19-9-2) won’t see each other again in the future with each fighter holding one win apiece in the series. Tatsumitsu Wada punched his ticket into the semifinals of the ONE Flyweight Grand Prix with a unanimous decision win over former Olympic wrestler Gustavo Balart on Friday in Manila. In what turned into an ugly striking battle over three rounds, Wada was constantly trying to figure out a way get inside on the much shorter Balart as he was throwing power punches from the first second of the fight until the last. The fight was paused midway through after a series of head butts were stinging Wada during the exchanges on the feet. It appeared Wada was the one diving in with his head down but because Balart was so much shorter, the top of his head was clashing with his opponent. 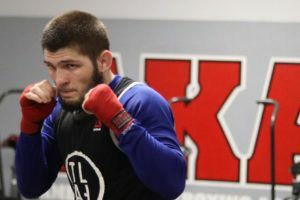 As time ticked away, Balart seemed to be winning the exchanges on the feet as he would unleash three and four punch combinations in a flurry while Wada was content to counter strike. Still Wada was managing to land some punches, which opened up a cut on Balart’s head and it was obviously bothering him as the Cuban born wrestler kept wiping blood away from his face throughout the second and third rounds. When the fight was finished both fighters obviously believed they did enough to win but it was Wada who got the nod on the judges scorecards while Balart (8-2) was shocked at the result when the decision was rendered. Either way, Wada (21-10-2) moves onto the next round of the tournament where he faces in the semi finals Johnson later this year. Following a loss in his last outing, submission specialist Leandro Issa bounced back doing what he does best with an armbar finish against Fu Chang Xin. It was a textbook performance from Issa, who was quick to secure the takedown before shredding Fu’s defense to move into the mount almost immediately after getting the fight down to the ground. Once he secured the mount, Issa quickly transitioned into the armbar and it appeared that Fu had nowhere to go without the Brazilian taking his limb with him. While the submission looked very deep, Fu kept fighting and that forced Issa to make another adjustment, this time locking up the triangle choke from the bottom. Just as it looked like Fu might be slipping free, Issa once again torqued the arm from his position on the ground and that was enough to get the finish this time around. The referee rushed into stop the fight before Fu took any more damage to his arm. The victory moves Issa to 17-7 overall with a 4-1 mark in ONE Championship over his last five fights. Fu drops to 9-2. 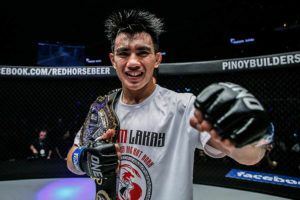 James Nakashima really wanted to make a statement in his second appearance in ONE Championship so he could earn a title shot against reigning welterweight champion Zebaztian Kadestam. The former LFA champion got the win against former title challenger Luis Santos but it was a bizarre ending following a takedown in the second round that apparently caused an injury to the Brazilian. The incident occurred after a blazing start from Santos after a somewhat lackluster opening round from both fighters. Santos came out guns blazing in round two as he looked to overwhelm the undefeated American. Santos landed a devastating right hook that seemed to wobble Nakashima and put him on rubber legs for a split second. Santos followed up with a leg kick but Nakashima was able to grab it and dive on a takedown to bring the action into his world on the ground. Upon replay it appears that Nakashima’s takedown may have hyperextended Santos’ leg because a few seconds after landing on the ground he was tapping out to signify the end of the contest. While it wasn’t the win he wanted, Nakashima (11-0) still got the victory and now he awaits word if that was enough to earn him the next shot at Kadestam and the ONE welterweight title later this year. Santos drops to 65-12-0-1. 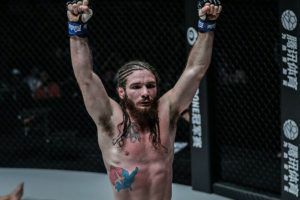 Following a TKO loss to Christian Lee in his last outing, Edward Kelly got back on track on Friday with a ground and pound victory against South Korea’s Sung Jong Lee. The opening round in this featherweight contest moved fast and furious with Lee almost immediately taking the fight to the ground looking to apply his high level grappling game. Lee nearly wrapped up a heel hook but Kelly defended well and then began firing down on his opponent with punches. Almost the entire first round was spent in the scrambles with Lee trying to find a submission, Edward defending and then blasting away with punches and knees every single time he broke free. The second round started out in similar fashion but Kelly looked more comfortable on the ground this time around as he was chipping away at Lee’s defense with a relentless series of punches. As much as Lee tried to fight back or get free of Kelly’s striking onslaught, he just couldn’t get back to his feet and ended up spending much of the round covering his head in order to survive. Finally with Kelly still hammering away from the top, the referee saw enough and opted to stop the fight to prevent Lee from taking any further damage. The end game at 2:51 into the second round as Kelly gets back in the win column, moving his overall record to 12-6 with his latest victory in ONE Championship. Lee drops to 4-5.